Here’s a short quiz. You have $1,000 to spend on upgrading your stereo or home theater system, what do you buy to get the most bang for your buck in sound quality? If you answered anything other than ‘room acoustic treatments,’ you might achieve only an incremental improvement in sound quality. If you answered ‘room acoustic treatments’ you would be making a significant upgrade. The reason is simple: The listening room is a critical component in the sound reproduction chain, at least as important as speakers, electronics, sources, and cables, yet the listening room is often the most neglected component. When sound waves leave a speaker they interact with the walls, ceiling, floors, furnishings and other surfaces in the room causing room resonances and reflections that color the sound you ultimately hear. Room resonances are sound waves generated by the speakers from 20Hz to about 300Hz. The frequency of the resonances is based on the dimensions (length, width, and height) of the listening room. A room resonance either reinforces or attenuates bass frequencies and the most common symptom is heavy or muddy bass, or conversely, thin, weak bass. A typical room will have boomy bass somewhere between 50Hz and 70Hz. There is an easy way to identify the resonances in your room using a room acoustics calculator. Enter the dimensions of your room (height, width, and length) and the calculator will determine the problem frequencies. Room reflections are caused by sound, mostly high frequencies reflecting off of adjacent walls that combine with the direct sounds you hear from the speakers. In most cases, you hear more reflected than direct sounds. The reflected sounds reach your ears milliseconds later than the direct sounds because they travel a longer distance. In general, sound reflections degrade imaging, sound staging and the overall tonal quality, important characteristics of a good sound system. A simple way to locate the reflection points in your room is to have a friend hold a small mirror against the wall while you're seated in your primary listening position. Have the friend move the mirror around the wall until you can see the speaker in the mirror. The location of the mirror is a reflection point. 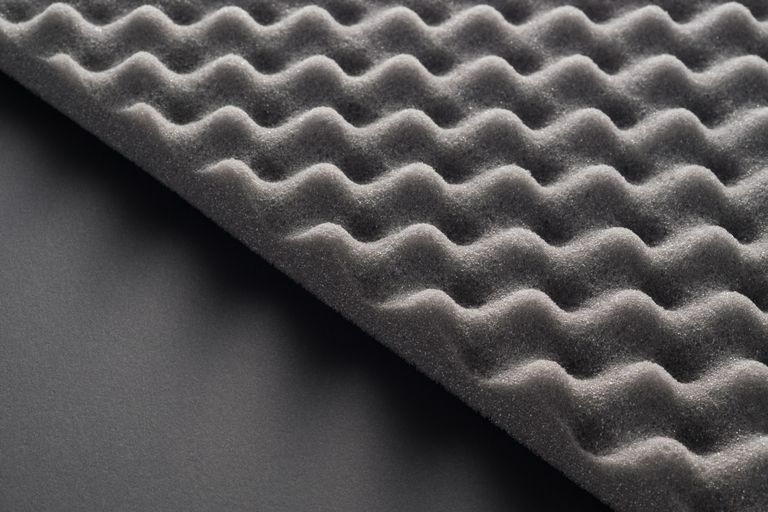 The solution for room reflections is acoustic absorbers and diffusers that, when placed correctly, allow you to hear more of the speakers and less of the room. In other words, more direct sound and less reflected sound. From personal experience, We can say that room acoustic treatments have improved the sound quality of our system more than any upgrade we have ever made. Any upgrade! When bass improves, tonal balance is restored and the rest of the system sounds better. When room reflections are controlled (not eliminated) it is possible to resolve much more detail.